Air France is currently undergoing a general process of reorganisation, named Transform 2015, and will hope this move helps return its short and medium-haul operations to profitability. 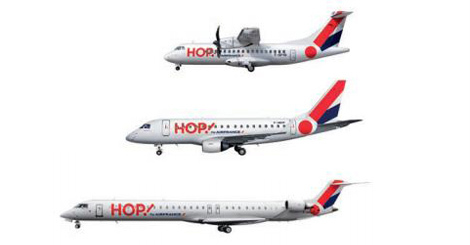 From summer 2013, Hop will operate point-to-point flights from Paris-Orly and the domestic network, as well as flights to the hub at Paris-Charles de Gaulle on behalf of Air France, including services to Bristol and Aberdeen. This move comes a couple of months after Lufthansa decided to switch all non-hub regional traffic to its Germanwings brand (see online news December 6). Hop is also offering a similar fare structure to Germanwings, with Basic, Basic Plus and Maxi Flex options, with one piece of cabin baggage and a snack included whatever fare paid. One piece of checked baggage weighing up to 23kg is charged at €15 per leg when paid online and €30 at the airport for the Basic fare, but comes included on Basic Plus. A second piece costs €44 for both Basic and Basic Plus customers when purchased online, and €55 when purchased at the airport. Maxi Flex customers can check-in two pieces of luggage free of charge. Seat selection is not yet available but will be to Maxi Flex customers come July. Flying Blue frequent flyer miles may be accumulated at a rate of 400 for flights within France and 800 for flights in Europe on the Basic Plus fare and double this when flying Maxi Flex. Basic customers must pay a €5 surcharge for 250 miles. Earlier this month Air France launched a low-cost “Mini” fare on domestic flights from Paris-Orly, as well as “most medium-haul flights on departure from the regional bases in Marseille, Nice and Toulouse.” This does not include seat selection, checked luggage or frequent flyer miles (see online news January 7). For more information visit hop.fr (under construction).